In the 30 years since the term “lean” was introduced as an interpretation of the Toyota production system, great efforts have been made by many people to gain the interest of CEOs due to the widespread recognition that Lean must be led from the top. While there have been some notable successes in the use of Lean as a company-wide management system, most CEOs ignored Lean either as a production system or as a management system. CEOs who have taken an interest in Lean typically view it as applicable only to lower-levels of the organization, where employees are required to use various tools and methods to improve work processes, particularly in operations. Some leaders used Lean at a higher level, as a strategy for improving the performance of a functional area such as operations, in support of the corporate strategy. The book, The Lean Strategy (Ballé et al., 2017), seeks to correct these narrow views of Lean by framing it in relation to CEOs’ responsibility to develop and execute corporate-level strategy. Does the book succeed? Is Lean a corporate-level strategy? The Lean Strategy purports to be “a groundbreaking and revolutionary book that will transform how lean is understood, practiced, and used within organizations.” While the book breaks some new ground, it is certainly not revolutionary. Instead, it presents the authors’ experiences, common to many other authors, and synthesizes previously published works to tell stories that have been told many times over in the TPS and Lean literature. The focus of the book is improving corporate performance primarily through improved operations. On many occasions, The Lean Strategy comes across as an over-the-top appeal to CEOs based on a very small sample of businesses that had noteworthy success with Lean (actually, more TPS-like success than Lean success, as the two remain quite different [1, 2, 3]). The book contains a lot of good information that will help CEOs better understand Lean management and the new learning routines that they and other employees must engage in. The book strengthens many weaknesses in earlier formulations of Lean and aligns Lean more closely with Toyota’s unique management system. However, Taiichi Ohno said that TPS was a management system (TPS, p. xv). He never thought of Toyota’s management system (TMS) – an offshoot of TPS – as the corporate-level strategy, nor does current Toyota management. What changed to make Lean, modeled after TPS, a corporate strategy? Is Lean a strategy merely because four authors with good credentials say it is? Or, have the authors made the common mistake of confusing strategy with execution? The Lean Strategy is not convincing as a corporate strategy book. The book is clearly mistitled. A more accurate title would be The Kaizen Strategy because its contribution is to add to the already heavy weight of evidence, accumulated over three decades, that Lean (TMS) is a company-wide management system whose basis is learning through various structured problem-solving routines – especially kaizen. The book will likely appeal to the handful of CEOs who already more-or-less think that way. Where the impact is positive, the book will have served its purpose. 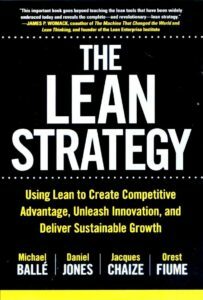 The book fails in its mission to convince readers that Lean is a corporate strategy. However, it does make the case that Lean, as a management system (or learning system), has strategic implications for organizations, and that kaizen is fundamental to achieving competitive advantage, innovation, and growth. Many other books prior to The Lean Strategy have done this as well. At best, kaizen can be part of a corporate-level strategy, but never the sole corporate strategy. The topic would have been better presented as a 20-page article in Harvard Business Review. Book-length treatment seems excessive. If CEOs and those who specialize in corporate strategy cannot be convinced Lean (actually, kaizen) is a corporate-level strategy in a short article, then a 304-page book is unlikely to do it. At times, The Lean Strategy is written in a repetitive, inefficient, confusing, and sometimes contradictory manner, with many annoying clichés and some ridiculously long sentences (e.g., p. 10, paragraph 3, first sentence, 83 words and p. 50, paragraph 4, second sentence, 97 words). This results in many more pages than is necessary. Surprisingly, The Lean Strategy does not address CEOs’ fast-growing interest in digitization of business processes, corporate digital transformation, artificial intelligence, and virtual reality (for that, see Conversations with Taiichi Ohno: Management Insights for the Digital Age). This omission makes Lean seem behind the times, and The Lean Strategy as a capstone work that both defines and completes the Lean era. Dust jacket, “Since the introduction of Toyota-style Lean management two decades ago…” It is three decades ago, not two. In attempting to make the case that Lean is a corporate-level strategy, why didn’t the authors write about these five things in the Introduction or in Chapter One: 1) What is corporate strategy? 2) What is functional (e.g. operations) strategy? 3) Examples of corporate and functional strategies. 4) Why Lean is not an operations strategy. 5) Why Lean is a corporate strategy. By not doing this, they create a large mismatch between the book title and the book content. Half-way into the book we learn what the Lean strategy actually is: Kaizen. “We should note that a Lean strategy is a superior business approach…” (p. 10). The previous 17 pages made that point several times. So why say it again? “Toyota’s Lean system…” (p. 80). Toyota does not practice Lean. Toyota does not have a Lean system. Coverage of “Respect for People” is surprisingly limited (pp. 128-132) given its great importance in achieving business results. Page 13, Figure 1.2. Arrow should point to right, not both left and right. Page 14, reference to “zero inventories.” TPS is not a zero inventory system. Page 15, “What is known today as the Toyota Production System is not the Toyota production system: it is not the sum of Toyota’s current production practices.” What? Page 16, “…improved productivity by about 30 percent in the course of two years.” That’s all? With Toyota-style kaizen, it should have been a 300 percent increase in productivity over the course of two weeks! Page 21, “It finally dawned on us that the true revolution of Lean was cognitive, not organizational.” Actually, it is both, as Ohno-san said. Page 27, Table legends are located at the bottom of the Tables, not the top of the Tables. Page 82, “Note that neither Taylorism nor management by the numbers engenders real initiative from either workers of managers.” That is an inaccurate characterization of Taylor’s work both pre- and post-Taylor’s death in 1915 though the late 1930s. The authors’ say that everything about TPS changes (dynamic), while nothing changed with Scientific Management during its day (static). This characterization of Scientific Management is wildly incorrect. Lean thinking has undergone a number of changes in definition over the years. In The Lean Strategy, the definition of Lean again changes and shift towards emphasizing kaizen. On page 242, it says: “…kaizen is Lean thinking’s main object of study.” That is something new, as kaizen has been largely ignored in favor of Lean tools such as value stream maps, A3 reports, gemba walks, and coaching. The book is expansive in its treatment of Lean as a social science (social psychology) applied to business. Yet, it almost entirely ignores the industrial engineering basis for TPS, out of which the social science narrative grew. Toyota-style industrial engineering is also the source for major business results such as productivity improvement and cost reduction. The reasons for the poor treatment of industrial engineering within the three-decades old Lean framework remain unclear. Principles 2, 3, 4, and 5 of Lean thinking seem to now be dead (p. 20-21). Their demise was not revealed to us until 21 years after the book Lean Thinking was written, despite being apparent to the authors sometime ago. Are execution and strategy no longer separate as the authors say? Taiichi Ohno made clear in his book that TPS was the means TO AN end. TPS (the “means”) arose from need — cost reduction and productivity improvement (the “ends“). These “ends” were not Toyota’s strategy, but positive results that would surely contribute to Toyota’s strategy. Lean, a TPS derivative, is also a means to an end such as customer satisfaction. This can be expressed as a cause-and-effect relationship, (if x –> then y), where x is TPS (execution) and y is a strategic objective (“customer satisfaction,” not the strategy itself). The Lean Strategy says execution and strategy are no longer separate. That suggests “means AS ends” (if x –> then x); that Lean is both the means and the ends, and that cause and effect are simultaneous. This seems illogical. What capabilities are essential to adding [financial] value to your businesses and differentiating customers’ value propositions? How do you add [financial] value to your businesses? Can Lean be the top-level corporate strategy if Lean cannot answer questions 1, 2, and 3? If no, then strategy and execution cannot be one and the same; they remain separate. But, a Lean mindset can surely help top executives avoid stagnating strategies and embrace continuous strategic renewal and innovation. That would be a very good thing. What is the Lean strategy? This we finally learn in Chapter 6 (pp. 141-162): Kaizen, a hands-on method that combines improvement with learning, and which, importantly, re-introduces an element of craft work to the workplace. A part of Toyota’s corporate strategy, as expressed by their Global Vision 2020, is “Always Better Cars.” This reflects the influence of kaizen in Toyota’s corporate-level strategy, which I discussed in a series of blog posts in fall of 2016. To learn more about Toyota-style kaizen, see Kaizen Forever: Teachings of Chihiro Nakao and Shingijutsu-Kaizen: The Art of Discovery and Learning. But be warned: There are many flavors of kaizen, most of which do not deliver business results. Lean-style kaizen (kaizen minus IE) is not the same as Toyota-style kaizen. Toyota-style kaizen is a very specific adaptation of industrial engineering methods, and it yields business results. CEOs must recognize that Toyota-style kaizen, as part of corporate strategy, will be personally challenging and more difficult to execute that the usual (delegated) corporate strategies such as mergers and acquisitions. Ultimately, The Lean Strategy is about Lean as a management system and argues that kaizen should be the corporate-level strategy. Kaizen can be an element of corporate-level strategy, but not the sole corporate strategy. Embrace the words “radical, “revolutionary,” “transformation,” and the like. Transform themselves first, before the organization. Be humble and willing to learn almost everything anew. Be empathetic towards employees and teach them new ways of thinking and doing things. Accept logic and evidence as the winning formula. Eschew their own social needs, to fit in among their peer group, and instead join an out-group and enjoy being an outlier. Largely abandon giving orders, even though most workers and other stakeholders may prefer that. Promote bi-lateral respect between labor and management and multi-lateral respect between all stakeholders. We were wishful in our deductive thinking that these were easy asks of CEOs. We were wishful in our inductive thinking, believing that the small sample that we saw as successful with Lean (or TPS) could be generalizable into a much larger sample whose limits were unbounded by the reality of what we were asking CEOs to do. The Lean Strategy continues in this unproductive tradition. Perhaps these will someday become easy asks of CEOs, as circumstances change or sometime later in human or business evolution. Thank you for sharing your insights. I will read the book myself, but it does sound like it might be a good summary for C-suite. I am a bit shocked by the revelation. Is it really framed like that? Side note, thank you for repeatedly pointing out the importance of industrial engineering. Being one myself I might be a bit biased, but the evidence of IE playing an important role in developing TPS shouldn’t be ignored. If TPS and IE are intertwined, why ignore IE when talking about Lean body of knowledge? You’re welcome. Yes, it is framed like that. I read the first three chapters and have set the book aside. I wouldn’t give this to a CEO. I won’t be reading more. I agree that the book never defines what “strategy” is and why Lean would be a strategy. Much of it was just badly written – I ended up circling many of the things that you pointed out. I was really disappointed with the book. I’ll just leave it at that. For almost 20 years, Art Byrne has been saying that Lean is a (corporate) strategy. Perhaps The Lean Strategy is a paean to Art or his message. The book is destined to disappoint because the title does not match the pages. Well, Orry and Art obviously worked together. Yes, for for 12 years. You can’t say that the book never defines strategy when you haven’t read the whole book. How do you know it doesn’t include a definition after chapter 3? The commenter (Anonymous) is correctly noting the fact that definitions of corporate and other types of strategy are undefined in the beginning chapters of a book with the word “strategy” prominently featured in the title. This is a surprising fundamental error on the part of the authors and publisher, McGraw-Hill – especially given that Lean has for decades been widely seen as an operations strategy or management system, not a corporate strategy. The publisher is responsible for the editorial process, which, in this case, failed to catch and correct this fundamental error. Thanks a lot Bob for your detailed review. As an economist who learned about Womack/Jones work in the early 1990s I am still amazed how narrow the focus of the lean community is. Going back to Samuel Smiles, a Scottish philosopher, from the Toyoda family took a lot of input for what eventually emerged as TPS, there is still a huge heap of unseen and unused opportunities in organizations (of any kind). Hi Ralf – You’re welcome. I agree that focus has long been too narrow. I am half way through the book and it provides some pretty profound and interesting perspectives about Lean thinking. The opening discussion about formulating a strategy via learning-based execution vs. the traditional strategy-first-execution-second is fascinating. I suspect that because you were so focused on the book title and the definition of strategy, you missed all of the important messages in the book. Books like this are critical because they help keep up the momentum in helping the world understand the deeper meaning of Lean and how it applies outside the automotive industry. 27 years after “The Machine…” was published, we are still learning what makes Toyota tick. This book is simply another in a chain of important discussions in the Lean community by current thought leaders like Womack, Jones, Balle, Liker, Rother, Smalley, Dennis, and Rosenthal. I can assure you that I did not miss the important messages — most of which have been previously published in several books (including one of my own, Better Thinking, Better Results). Whether it is successful at keeping up the momentum remains to be seen. Thought leaders who all have the same thoughts don’t show much leadership. According to Daniel Drenzer, thought leaders “develop their own singular lens to explain the world, and then proselytize that worldview to anyone within earshot.” Conversely, public intellectuals present opposing views and identify ambiguities for people to reckon with.